Rohit Ail (left) explaining the remote-selfie feature at BBC launching event in July 2015. In November, the Samsung CSR Awards announced Rohit Ail, Principal Engineer of Samsung Electronics R&D Institute in the UK, as a winner for his leadership and development of micro:bit. Volunteering his talent, Ail has been vital in providing expertise for micro:bit in efforts to promote the future of coding. In close collaboration with the BBC, which reaches 98 percent of the UK population, micro:bit is a pocket-size, code-able computer that has been developed and is being distributed to one million children in the UK, free of charge. The vision is to inspire digital creativity and develop a new generation of tech pioneers. Each element of micro:bit is completely programmable via easy-to-use software on a dedicated website (microbit.co.uk) that can be accessed via PC, tablet or mobile. Created in direct response to the growing digital divide and emerging ICT skills gap in the UK, micro:bit would not have been possible without Ail’s enthusiasm, passion and technological expertise. Ail recruited a team of seven engineers to volunteer, who have contributed over 1,000 hours of time. His team developed functions to enable a user to control their smartphones and tablets via coding on micro:bit and vice versa. Coding on micro:bit can launch mobile device cameras remotely, or act as a remote control to play music on devices. “It only took an email explaining the whole project and our role in it to spark the enthusiasm and commitment of these seven engineers. I would like to take this opportunity to thank Anton Obzhirov, Tommaso Maestri, Mythri Venugopal, Frederic Ma, Kupesan Kulendiran, Nigel Cardozo and Balbir Sanghera for their contributions and support in this project. We also had wonderful support from my colleagues, Kit Lam, Soohyun Park and Minje Sung at every stage of this project,” said Ail of the team behind micro:bit. The application was built and shaped by the seven team members from scratch, entirely on their own. The functions of micro:bit will help children understand the concept of IoT and develop their own projects in the future. Ail and the volunteer team also helped in developing teaching resources for use at schools and at home with parents. The project has been championed by UK government ministers leading the digital economy agenda and endorsed by key educational organizations and celebrity ambassadors. Why is micro:bit so important? The UK is estimated to require an additional 745,000 digitally skilled workers by 2017, and one million tech workers by 2020. However, a large percentage of the population isn’t online and many students don’t have access to internet. The digital divide and the skills gap is a serious social issue in the UK. “Samsung has always been an expert in connecting the world through the power of mobile. We have done exactly the same with micro:bit. With the coding application, we have empowered kids to program on-the-go. They need not be in the classroom anymore for coding. They can take the experience with them anywhere they go. “Further, we have also given micro:bit its first companion in the real world. Our application is able to communicate with micro:bit and allow it to control a few functions of the phone remotely. Ail recalled his own experiences with coding while growing up. “As a kid, I was always interested in knowing the internals of any toys. I used to open up all my toys and try to refit them later. I used to play with LEDs and AA batteries, making all sort of small gadgets of my own. Ail has always wanted to support his community, using his skills and experience to do so. “I have in the past, applied for voluntary work in our local councils but never got the chance to execute it fully, due to time limitations and family commitments. 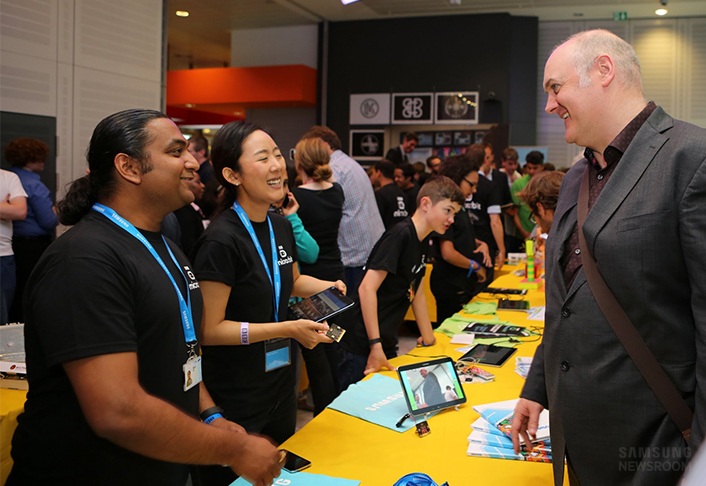 With the BBC micro:bit, I have found the opportunity to give back to society. The micro:bit is all about inspiring the young generation to code, something which I had never thought of giving back to society on my own, although this is my core expertise. I believe this project has actually given me an opportunity to give back using my strongest skill, in a beautiful way. I can never be thankful enough.